Interior room is generous and a rider feels comfortable, not cramped. The tested dark metallic brown van was the SL Limited model, the top of the line. It featured captain’s chairs in the second row and a third row folds down into the floor in back. These middle row seats also recline and feature foot rests too. Kia calls them Slide-N-Stow seats, which are standard even on the base L model that begins at $26,795 (including delivery). They flip forward and stow up against the front seat backs if you need more cargo room. From a driving standpoint Sedona feels much like other minivans, a bit hefty and not particularly responsive. The word us auto writers prefer is “vague” steering, meaning there is not much feedback or road feel. Still, the van is easy to handle and to park. The power, as mentioned before, is better than previously, but still not overwhelming. I witnessed some hesitation when hitting the throttle coming out of a slow turn. Yet the 6-speed automatic, up from the previous 5-speed, is smooth and efficient. There also is a drive mode select button on the console that lets you choose from Eco to Normal to Comfort. I kept it in Comfort most of the time. Ride is mostly fine, but on our terribly chuck-hole-strewn roads, the back-end did chatter a bit, delivering a bumpier rear seat ride than expected. I’m betting the ride is a bit smoother if you load four or five passengers in back to add some weight. Braking is fine though and both traction and stability control are standard. This model included 19-inch tires, while 18-inchers are standard on other trim levels. Inside, the Sedona is quiet and handsomely laid out. 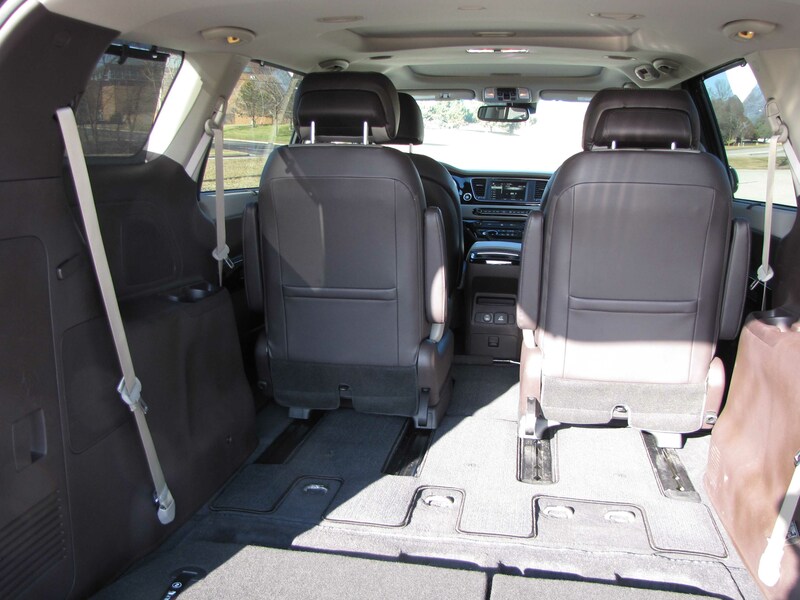 In addition to the highly functional and adaptable rear seating, the test minivan looked and felt upscale. The dash is beige over dark brown and the door armrests feature a fake dark wood-look trim while the dash, console and area around the center screen feature black gloss trim. Seats are beige and brown Nappa leather. All very sophisticated looking! Seating is fairly flat, but comfortable with mild side contouring on the seat bottom and backs. The driver’s seat includes power lumbar support and two-memory settings, controlled by buttons on the door. The test van had a large touchscreen and easy to see and use dash buttons. I like Sedona’s dash layout with two main gauges and a large digital computer readout between the speedo and tach. All buttons, and there are 21, on the dash are large and easy to use, as are five knobs to adjust the radio and the dual heat controls. Even the buttons on the touchscreen radio are large and easy to use, but as always, you’ll need to remove your gloves to operate the touchscreen. Buttons to open the power sliding side doors and hatch are on the key fob and there are buttons overhead inside to operate those functions while in the vehicle. 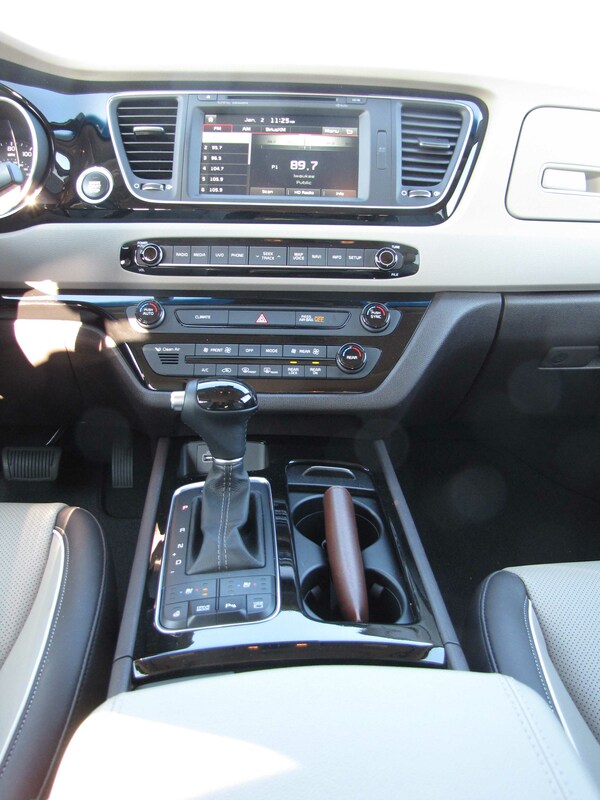 This model features push-button start too, but that’s only standard on the top three trim levels. Standard here too are a voice-command navigation system, blind-spot warning system, Infinity surround sound audio system, back-up camera, heated steering wheel and UVO telematics. Warning, that wheel gets very hot, so you’ll likely want to turn it off after a few minutes, although this van also had a wood portion atop the wheel that did not heat up, so you could rest your hands there once the wheel warmed. Most everything worked flawlessly too, with the exception of the radio. It liked to jump bands unexpectedly, from AM to FM, and vice versa. I found no pattern, except that it often happened when the vehicle was first started and very cold. 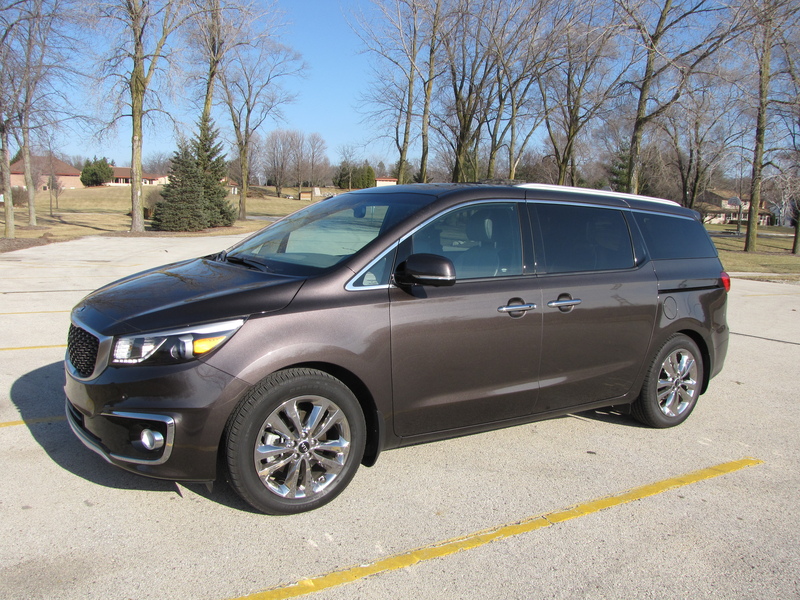 The test van also added a technology package that gives the vehicle Xenon HID headlights, a Lane Departure Warning System, forward collision warning system, surround view monitor and smart cruise control for $2,700. I find lane departure systems mostly annoying, but you can turn it off via a dash button. The surround view monitor was helpful in a particularly tight parking space and smart cruise control you adapt to over time. Gas mileage was not as good as I’d hoped. I managed just 17.2 mpg in about 60% city driving. The EPA rates this at 17 mpg city and 22 mpg highway. You could expect lower mileage if you had seven or eight people aboard too. As mentioned before, the base L model starts at just shy of $27,000, and there are five trim levels that culminate in the SX Limited with a starting price of $39,700, plus $895 delivery. Including its one option package, the test van hit $43,295. Side doors slide wide open for easy access to the second and third-row seats, an attractive two-tone in the test van. 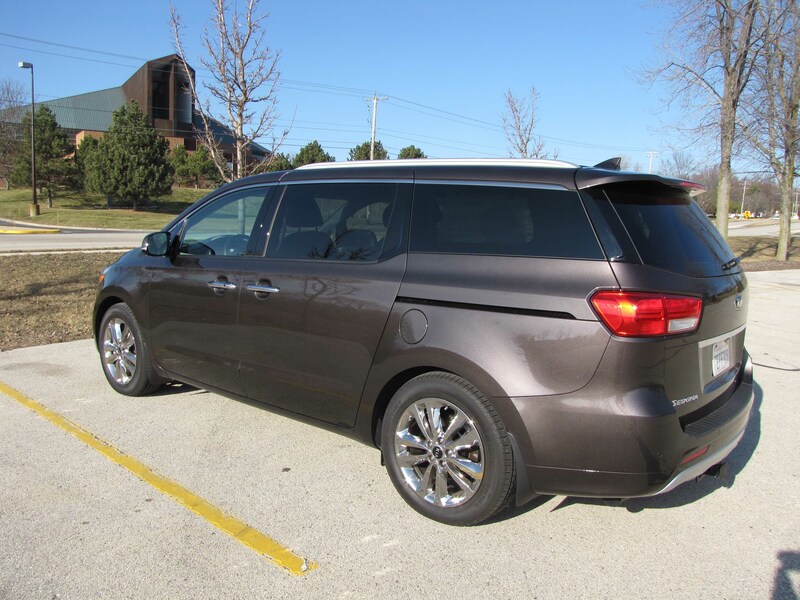 The minivan market is full of nicely equipped models at varying prices. 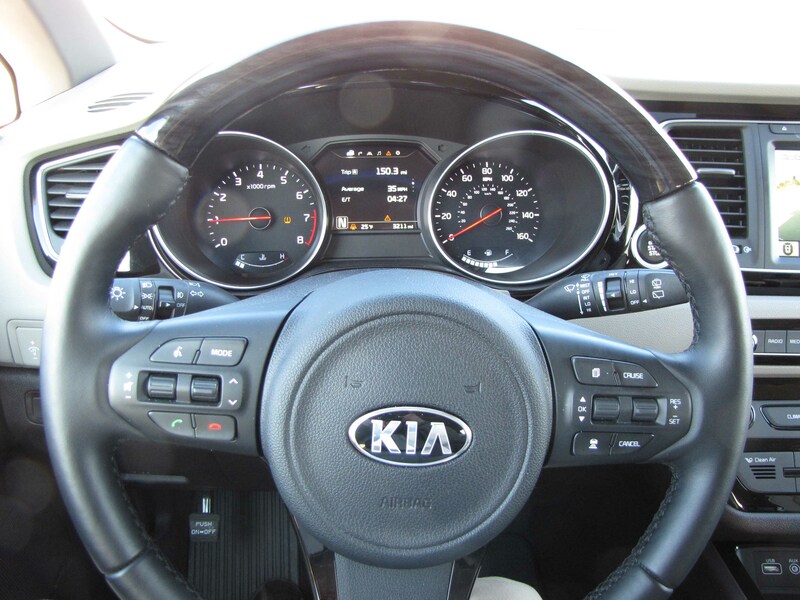 Kia gives you more of the goodies, especially electronics, that many folks want or expect now, but at a little lower price. Shop for exactly what you need, but be sure to include the Sedona among your options now. 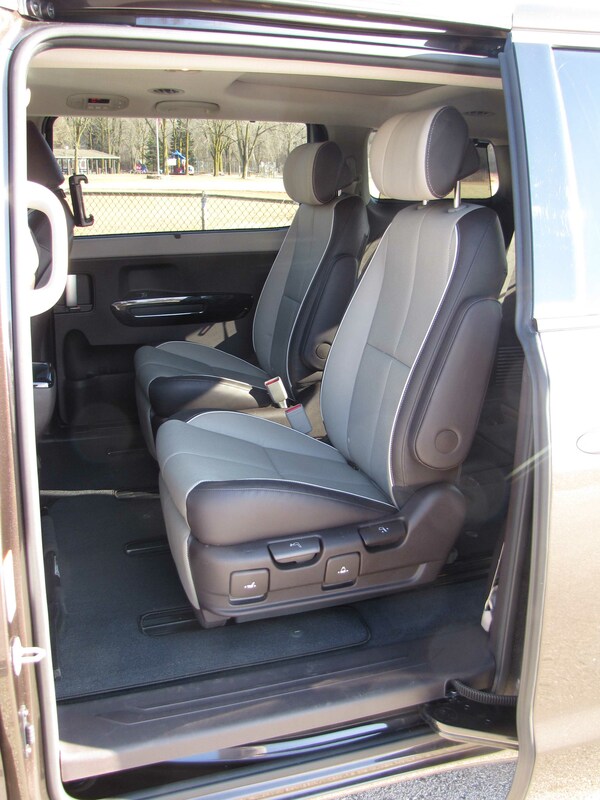 Hits: Useful minivan can seat up to eight, quiet interior with power hatch and sliding side doors, third seat folds into floor, heated/cooled front seats, heated wheel, blind-spot warning, good dash layout, large dash buttons, big touchscreen buttons. Misses: Vague steering, sometimes choppy ride in back, heavy feel and radio jumps bands unexpectedly. There’s a ton of room when the third row seat is folded flat.